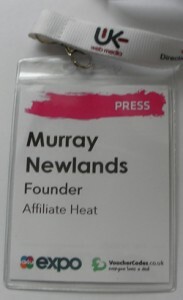 The A4uexpo are a great success drawing in most of the UK affiliates living in the UK and Europe. Matt Wood and his team choreographed the event with military precision. I got to a lot of conferences and events and this one had the best timing and organization I have seen in a long while, look out Adtech. If you wanted to meet and network with the UK affiliate marketing industry then A4uexpo continues to be the event to go to. I could talk about great food etc but it is all about the networking and business that comes out of it. There were more sessions than I have seen at other conferences covering a full cross section of online marketing subjects for those seeking to learn the basics about emerging topics. The only down side for the A4uexpo conference was that the layout of the venue meant that the A4uexpo exhibition hall possibly did not have the foot traffic as much as it might have otherwise. If you missed it this year and you are asking yourself is it worth going to next year the answers is YES. Well done and thank you very much Matt Wood and team for a great event well executed.